Amidst an explosion of giant, brightly colored roses hand-crafted from paper in a neighborhood mercado in Mexico City, I kept thinking of Frida Kahlo’s incredible drive to keep painting all of her life’s challenges. A day trip over the holidays took us to San Angel, site of the Bazar Sabado Market, a wonderful Saturday street fair of creative handicrafts on the outskirts of this enormous city. Her candle of life burned brightly for only 47 short years. She made the most of her time as she prolifically painted her life experience and was known particularly for her self portraits. Badly hurt during a street car accident as a young woman, she battled painful spinal injuries for all of her adult life. Many people continue to be inspired by her example as they see how she transformed her pain by expressing her emotions though her art. 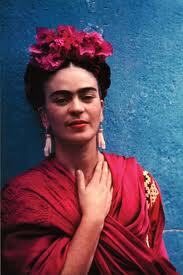 That day at the museum watching the film of Frida’s life, the woman sitting next to me was weeping. When it became too difficult for Frida to sit in a chair to paint on a regular easel, she would lie in bed and paint on a canvas that her mother had suspended from the ceiling for her. She had a tumultuous relationship with the renowned muralist Diego Rivera who she married twice. He loved many other women, including her sister. She said he was the other great wound in her life, as well as her great love, muse and mentor. When I saw the house they built together after they married for the second time, I was struck by the duality of it — two artist studios with a connecting passageway, separate but equal. Her Casa Azul in Coyocan and the collection of her art at Museo Dolores Olmeda near Xochimilco in Mexico City help to round out her story even more. Frida’s determination to express herself through her paintings, despite challenges both physical and emotional, resulted in a prolific chronicle of her entire life. To this day, her authentic aesthetic is revered and she is one of the most famous women artists in all of Mexico. 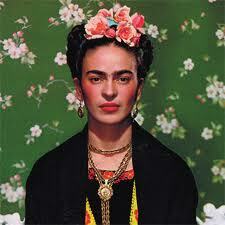 Cultural Adventure: (San Francisco) Visit the San Francisco Museum of Modern Art to see some of Frida Kahlo’s paintings. Look at the hand-painted murals at Coit Tower and the Beach Chalet in San Francisco. Imagine Diego Rivera guiding their design with Frida Kahlo at his side. Visit the Mexican Museum at the Ft. Mason Center in San Francisco and Precita Eyes in the Mission District on 24th Street near Portrero to learn about contemporary mural painting. Walk north around the corner to Balmy Alley to see some recent murals. Email marian@marianhubler.com for news of future blog posts. Hey, I just stopped by to visit your site and thought I’d say thanks for having me. That is a well written post with some great insight and ideas. Oh, and it might be helpful if you tell people where the modern day murals in the Mission are, just in case!